The Griqua are an interesting multiracial group formed as a byproduct of colonial expansion from the Seventeenth Century. They were probably descended from a combination of European, Khoi, San and Tswana inter breeding. As racial attitudes hardened, the Griqua migrated north and east to establish settlements out of the way of the Europeans. Those going north had been offered land by Dr Phillip a London Missionary Society Representative who was aware that the Boers were eyeing the area as part of the their Great Trek of the 1830s and 1840s. 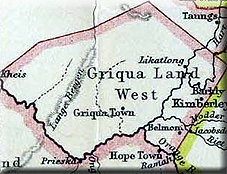 The Griqua jumped at the opportunity and formed what would be called Griqualand West. In 1848 the British annexed the entire area between the Orange and Vaal Rivers, which included the Griqualand area, and called it the Orange River Sovereignty with a Magistrate at Bloemfontein who flew the Union Jack. Due to the high costs and low returns the British were to withdraw from the area thanks to the Bloemfontein Convention. It did not help the British that they were about to embark on the Crimean War, so were looking to consolidate imperial adventures for the time being. In 1854 the Orange Free State was established and the Transvaal would slowly form by 1860. This also meant that Griqualand West was technically independent but it would have to fight off incursions from Boers or any other interested groups. The Griqua formed their own political units with a Captain in charge and had a clear, written constitution. They spoke Afrikaans and were Protestant Christians. However, they were aware that the Boers had little regard for what were referred to as 'half-castes' and had frequent clashes with them. Official British interest in Griqualand was purely opportunistic. In the early 1870s rich diamond mines were discovered. 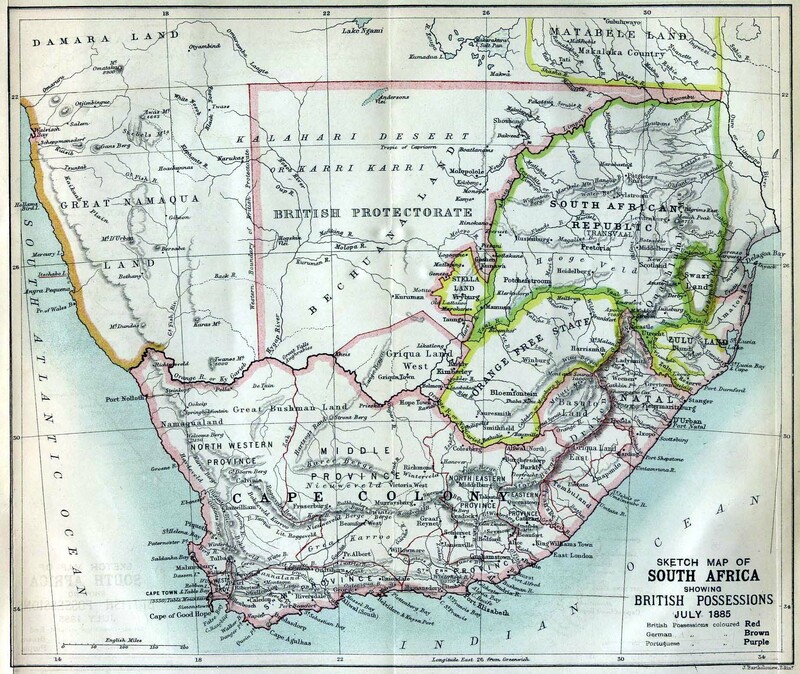 As Griqualand West bordered Transvaal and the Cape Colony, both colonies would claim an interest. The Boers and the British were antagonistic and hostile to each other, each colony did not wish the other to take control of such a rich resource. The Transvaal claimed this area based on the Bloemfontein Convention which had stated that the British were not interested in areas north of the Vaal River. The Griqua however were mindful of the poor treatment of blacks and half-castes by the Boers and requested British protection rather than Boer protection. This was probably regarded as the lesser of two equals by the Griqua who realised that they would not be able to withstand a powerful concerted attack by either European power. An independent arbiter found in favour of the Griqua rather than the Boers. This allowed the British to declare a protectorate over the area from Cape Colony in 1871. However, the British moved with rather indecent haste and declared that Griqualand West was to become a full Crown Colony just two years later. The purpose for this haste was to force the Griqua Captain to sell his mineral rights and those of his people for a thousand pounds per year. The Transvaal was understandly incensed by this diplomatic sleight of hand, arguing that Britain had challenged Boer attempts to annex lands whilst annexing it for themselves. Seven years later, the full aborption of Griqualand West was completed when it was subsumed into the Cape Colony. This was after Griqua unhappiness over ownership of their land and the right to make claims on the diamond fields led to a full rebellion in 1878. 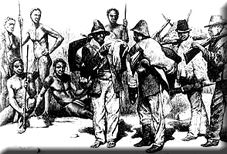 The Griqua and Tlhaping rose up against the British but were crushed. The Griqua were to see little of the wealth that was to be generated from the enormous diamond mines. They were later to suffer from the racist policies of the Union of South Africa and even more so under the apartheid policies of the Republic of South Africa. Explains about Griqualand West and East.